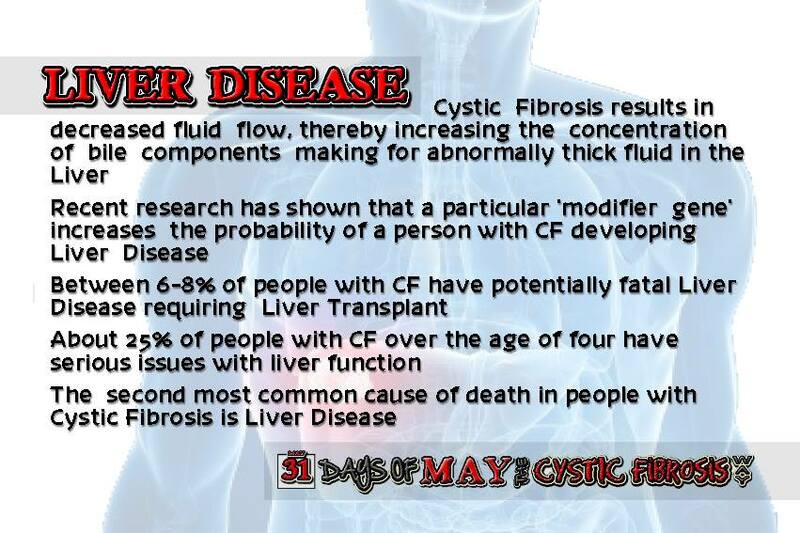 CFRLD/CFLD or CF related liver disease is yet another common thing in CF. Mild liver involvement with abnormal liver blood tests or fat in the liver is common. In some patients, the liver problems caused by CF are much more important than the lung disease. Advanced liver disease in individuals with CF is called CF liver disease (CFLD). Severe scarring of the liver, called cirrhosis, can occur in CFLD. Many CF patients with liver involvement do not have any symptoms. In patients with advanced CFLD, patients may have a large liver and spleen. Problems with weight gain can occur. As the scarring in the liver becomes more severe, the pressure in the vein leading to the liver (the portal vein) rises and complications of portal hypertension can occur. These can include a large spleen, fluid accumulation in the abdomen (ascites) and bleeding from dilated veins (varices) in the esophagus or stomach. Rarely jaundice and bleeding problems can occur. Basically because of the thick sticky mucus it makes it hard for all things to flow and work correctly in our bodies. They can do a abdominal CT scan to see if there is any narrowing of the ducts and other areas affected. There is no known cure for CFLD, but there are ways to prevent or reduce health problems related the liver disease of CF. Intestinal bleeding can occur in severe CFLD, and medicines and procedures can be used to treat this. Patients with CFLD should be immunized against hepatitis A and B to prevent further injury to the liver. They should avoid alcohol use. There are medicines that help to basically open the ducts up so that things can flow more freely.